A little more than a month ago I was inspired to start my journey biking across America virtually, on my exercise bike. It's a total of 3,035 miles from coast to coast, and I am doing it via My Virtual Mission. I am wayyy out of shape and have issues with my joints, but I've been plugging along doing short rides almost daily. I was inspired to do this by a 500+ pound man who decided he would ride a bike across America to win back his wife and lose weight. One of my goals has been to try and match his miles that he will post daily when he gets back on the road. Today I read on Fat Guy Across America's Facebook page that he would be doing an organized ride this morning, so I watched his Strava to see how far he biked. He did 13 miles. 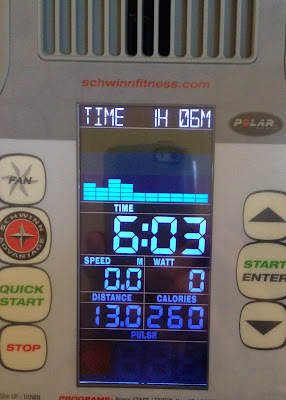 I have never done 13 miles in one day, but I took this as a challenge. I started out this morning and biked on a hilly circuit. I did have to stop and get off and walk around for a minute 2 or 3 times because my feet were going numb, but I did it! 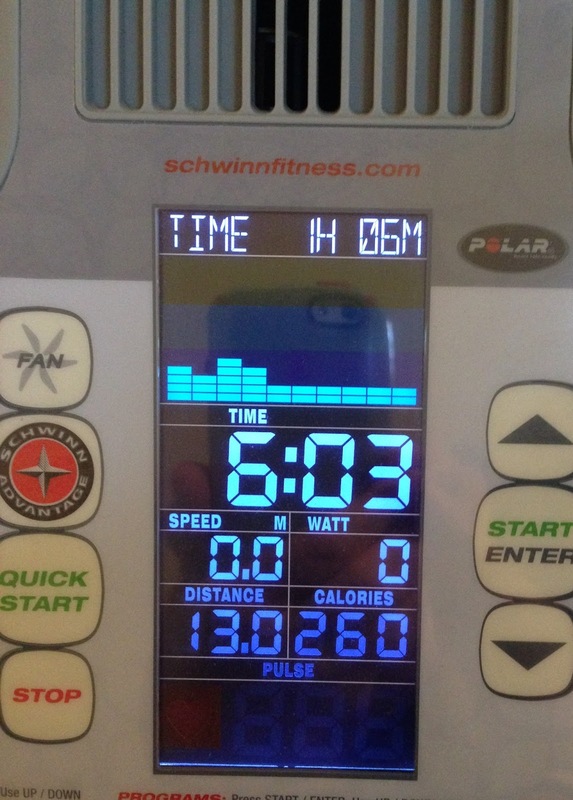 I rode 13 miles in 1 hour 6 minutes! It wasn't easy, but I am really proud of myself for doing this! Last night I made a tasty recipe for dinner. 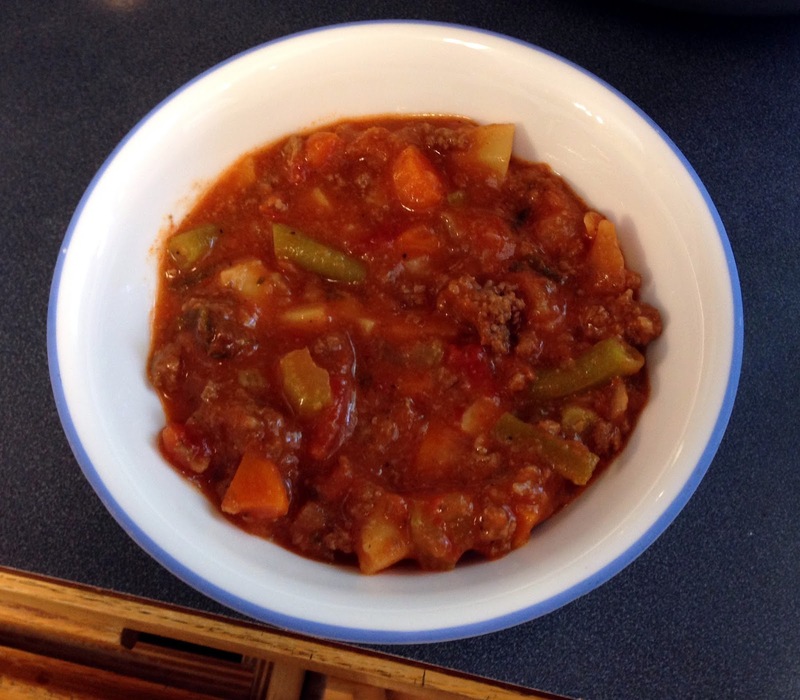 It's healthy and uses lots of fresh produce that is available right now. I used a lot of things from my CSA box to make this! It's delicious and low carb. I hope you enjoy it! Brown the ground beef with a few generous shakes of Mrs. Dash and the diced onion. When browned, add the seasonings and the garlic and cook for a few more minutes. Add all of the rest of the ingredients, stir, and bring to a boil. Lower the heat, cover and simmer for one hour or until all the vegetables are just tender. Remove the bay leaf; taste and season the soup as needed. You can add or subtract vegetables that you have on hand and can add water or broth to make it as soupy or thick as you like! I served this with biscuits for the kids and it was a hit! No one could believe it had kale in it, because they all "hate" kale, but I chopped it up very fine. Delicious! Tomorrow I start counting calories. I am not a fan of tracking, and would not have chosen to do this myself, so thank you for those who left comments on my last two posts helping make this decision easier. I will do my best and I hope the combination of tracking and biking results in better health and weight loss. Great ride! And the soup looks delish. That looks absolutely wonderful. It's the sort of thing I would make loads of and freeze in single portions for ease of use later on. Awesome job on the long ride! You are doing great!!!!! Joy, that's a good plan! I will have to figure up the calories in this soup and freeze it in individual servings. Great! And the recipe looks wonderful! That does look awesome. I will be sure to try it!-- and congrats on your Bike Ride. -- I need to come up with something like that! Please share what you ate today when the day is over. I am curious about your new diet and calories. Are you going to bike today also? Will do! Yes, I already biked 4.3 miles this morning and plan to bike again tonight. I'm a long time reader, but seldom comment. Just had to say CONGRATS AND GREAT JOB on your riding!!!!!!!!!!!!! I greatly admire your refusal to ever give up, and your thoughts have so often mirrored mine over the years. Keep fightin' the good fight!! no posts with calories? sup? honestly I am having a rough time. Lyn, I'm so sorry you are having a rough time. Is it the calorie counting? I know I would find that difficult, as it makes me obsess about food when I try to count calories and/or carbs carefully. All I want to do is eat! I'm rooting for you, and I hope things will get easier. Congratulations on your biking also. yeah, maybe, I don't know. I have a lot of stress right now and I start out the day counting calories and then I feel like I am "too stressed" and will "try again tomorrow." I am trying again tomorrow-ing all the way through the week. I add up the calories, I hit about 1200 usually right before dinner, and then I just quit. I have to get a grip. I can't imagine anything harder or less likely to succeed than going on a diet someone else picked when you don't want to. Of course you're having a rough time. I think given where you are NOW and what you've learned over the years you would be most happy and satisfied and still lose weight on Weight Watchers using the Simply Filling technique (no measuring or counting), but that's me. If you don't want to do it or any other plan you won't, and then guilt will only compound the problem. I'd stop and reassess.